Toys are necessary for the mental health of your parrot. 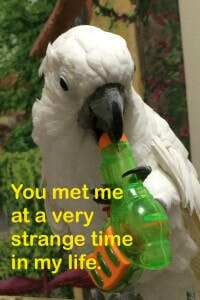 Without toys, a parrot or cockatoo will suffer extreme boredom which can manifest as aggression, self-mutilation or reclusive behavior. Toys are not optional. They are mandatory enrichment items that help an intelligent creature survive in our world. That said, it is important to note that they can also be a deadly hazard to their health in captivity. In the wild parrots are known to exhibit behavior that is strikingly similar to children playing with toys. They have a whole wild world of natural toys in the jungles and forests with which to play. They have parents, siblings and flock members to show them the safe way to enjoy their freedom; large parrots and cockatoos have a five year juvenile dependency period in which they learn how to live. In our world, they are taken from their parents before they hatch, raised in incubators, handled by human breeders and then sold (often to novice caretakers that have no idea what they are bringing home). These captive intelligent creatures are like autistic children in many ways. They do not know safe from unsafe unless we can teach them. It is up to us to teach them how to play safe, watch them to make sure that they do, and choose toys carefully to both enrich their lives and make sure that they stay unharmed. Choosing toys using good judgement is a key to safety. Another key is vigilance. To be relatively safe a toy is nontoxic, free of entanglements, and must not have easily ingestible small parts. As the director of a parrot and cockatoo sanctuary, I have seen many toys that appeared safe turned into death traps by a creative bird. Fortunately, keeping a vigilant eye on our flock has kept us from having deaths related to these “safe” toys. One such toy was a hanging wooden basket. This basket had nickel-plated chain so there was no danger of zinc poisoning. The chain attached to two sides of the wooden basket and came to a point with a small pear link to attach to the bars of the cage. One of our birds broke the pear clip and the basket fell. 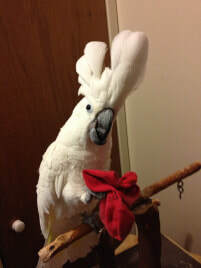 The basket wrapped around the umbrella cockatoo’s neck. He panicked. Running with the basket he twisted his neck from side to side and managed to wrap his neck with the chain; he could have choked to death. I had to capture him with a towel and then carefully extricated from the toy. Because I was there and vigilant Snoball was not injured. I no longer have hanging toys of this type in the play areas. Buying toys for your beloved companion birds is no easy task. There are many things to consider. I will go over the dangers in detail but do not let this make you paranoid. The issues that I will discuss are real and important. Nevertheless, you will need to make the best decision that you can based on available choices. This helps to limit the dangers arising from playing with toys; keeping an eye on them during play protects against unseen danger. Just do the best that you can; that is all that anyone can do. I make most of the toys for our birds myself both to cut costs and to insure their safety. I buy the wood, cut it into shapes, drill it, color it and string it on nickel-plated chain using split metal rings at the top and bottom. Next, I attach string and put beads and plastic shapes on. Sometimes I put colorful cloth ribbons or other adornments. A few of my toys have been misused by the birds, too. I just do the best I can. Again, safety combines caution in purchasing toys and keeping an eye on playtime. The toy has not been made that a parrot or cockatoo cannot use in an unexpected way. 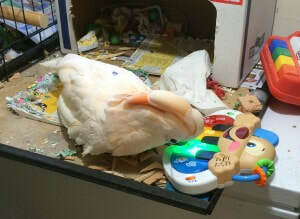 Cecelia, an umbrella cockatoo, takes dowels and matches toys with drilled holes to them. She inserts the toy into one end and then uses them much like a magic wand. In a way they are magic. Anytime Cecelia holds a toy the other birds run away. Cecelia becomes quite aggressive when she holds a toy, especially one of her own creation. I filmed her once picking up a toy boat by its long wooden handle from the floor. I did not realize at the time that she intended to use it against Murri, our Congo African Grey parrot. Murri had threatened her when she was at the top of the cage and she had climbed down right after this for the boat. She ascended the cage with it and confronted Murri. Murri continued to make vocal threats (actually saying, “Come on! Come on!”) while raising the feathers on the back of her neck, bending down and clicking her tongue. Cecelia started swinging the boat back and forth in front of Murri. I thought that this was cute. All of a sudden she angled the boat right at Murri. Bang! Murri jumped back. Cecelia pushed forward. Murri began to climb down the door of the cage and Cecelia beat her with the boat on the way down. Cecelia was using a toy as a weapon! Now who would have guessed that a cockatoo could think that far in advance and use a toy boat as a tool? Only Murri’s pride seemed to be hurt. If there had been any chance of injury I would have dropped the camera but it was obvious that Cecelia only wanted to stand at the top of the cage. Never underestimate these intelligent creatures. It is all on a video on our website. Let’s take on the three major categories of toy safety. The first need is that the toy be nontoxic. One question to ask is, “Where was the toy made?” Since most of the toys available now come from China it is often difficult to know if they are nontoxic. Most of us have heard horror stories about the products coming from China. The label may assure us that the toy is safe but can we be sure? We cannot be one hundred percent certain that a toy is nontoxic but we do have a few tools that we can use. Checking out the brand name online is one good way to see if anyone has had problems with that manufacturer. Use the search feature of your web browser (Safari, Firefox, Internet Explorer, etc.) to see what you can find out. Good search techniques are actually simple. Think of the keywords you will use to search in their order of importance. One example of a set of good keywords is: “parrot treasures,” toy, safety, (brand name, what the item is, and the issue at hand). I used quotation marks to tell the search engine that “parrot treasures” is a single search term: the manufacturer’s name. If you find that there are many complaints about the company then you have an answer. No complaints at least is a step in the right direction. If you find loud praise in many places then you can relax a little. Besides the origin of the product and the company background, we need to decide if we trust the toy materials. Should we get natural untreated wood or will dyes be safe? Paints are to be avoided but some dyes rate as safe for parrots, such as VitaCritter. Even so-called natural wood may treated and often there is no way to know. Natural wood may also harbor mold or bacteria. If you dye your own wood with VitaCritter or cake icing gel then you can use isopropyl alcohol as the medium for the dye and that will kill the mold and bacteria in the wood; it will also clean up any mouse or rat feces from the lumberyard. The alcohol evaporates quickly and the dyed wood is safe in 24 to 48 hours. Some woods are unsafe for birds such as Cherry wood. If you are making your own toys be sure to check the safety of the wood that you are using. A list of woods and their safety : http://www.avianweb.com/safewoods.html. Some materials have a bad reputation. PVC (Polyvinyl chloride) and Vinyl toys (a form of PVC) have toxic chemicals that may leach into your bird’s beak or through their pores in their feet. Yet, as far as I can tell, none of the long-time caretakers that I know has seen any evidence that vinyls cause toxicity in parrots; this potential for danger has not been known for long). The Wikipedia lists lead and other toxic metals as potentially leaching from vinyls. One Avian veterinarian advised me that he had never seen a problem arising from metal toxicity that had not been due to ingesting a piece of metal directly. Specifically, he was talking about feather destructive behavior that arises from such toxicity but this applies to other health issues as well. I watch our birds carefully when they are playing with plastic toys and look for signs that they are ingesting them. If I have any doubts then I remove the toy from the play area. Our next category is “free of entanglements.” Anything that frays might potentially be a hazard either from ingestion (small parts) or from entanglements. A frayed toy or perch might entrap the bird’s foot. If the bird panics then severe injury may occur. This is also true of materials such as towels, sheets, and furniture with material attached. I have seen both happen. Chloe chewed through the back of a chair (probably over a week or so of furtive chewing) and then wrapped the material around her neck. It looked as if she had a snake attached to her neck! One thing that I learned is that you must always check your birds to see if they can move. They are prey animals. Once, when I saw Chloe in her play area something didn’t look right. She stood and looked at me as if nothing was wrong. Following my rule of checking for mobility I walked over to her and removed the small piece of material covering her back; she was trapped by it. That is when I discovered her predicament. Rarely will a prey animal tell you that something is wrong. One acquaintance of mine failed to follow this rule and assumed that her bird just did not want to come out and play; she thought it was nesting. Sadly, her bird died because it was unable to get food and water. Her leg was trapped far back in the next box out of sight. I cannot stress enough that prey animals pretend to be in no danger when they are in these predicaments; this is because a predator will attack a wounded or trapped prey animal. So, when you are buying toys try to think, “Can my bird be trapped or injured by this toy?” Try and imagine how the toy will be torn apart, wrapped around, or twisted. Looking on the Internet under “dangerous parrot toys” can help, too! The last category is “easily ingested small parts.” Buy toys of a proper size. The small parts must not be small enough for your bird to swallow. Keep in mind that their powerful beaks can sometimes turn a larger toy into a smaller one. Don’t buy a toy meant for a cockatiel for your macaw. A toy recommended for smaller birds is only for smaller birds. That is one reason that there is a size recommendation in the first place, safety. In summary, a toy should be of proper size with no ingestible parts, free of toxins and as free as possible of potential entanglements. Since parrots and cockatoos as intelligent as a five-year-old child and the emotional development of a two-year old, they will outwit us constantly. Be as vigilant as a devoted mother for her toddler and that vigilance must be maintained for many years. Many parrots and cockatoos live as long or longer than we do. If you think safety when you make or buy toys and keep an eye on them while they are playing, then you have done your best for your feathered children. Besides, watching them with an open heart can bring awe and wonder back into your life. They are amazing. If you would like to learn more about making toys for your parrot, one excellent free reference work is The Parrot Enrichment and Activity book (there are two versions) that can be downloaded here: http://www.parrotenrichment.com/books.html. The author gives these to you at no charge. Not only is it safer to make your own toys it also enriches your understanding of just what your bird enjoys doing with toys. When you make them something with your own hands it not only enriches your bird’s life it enriches yours, too.